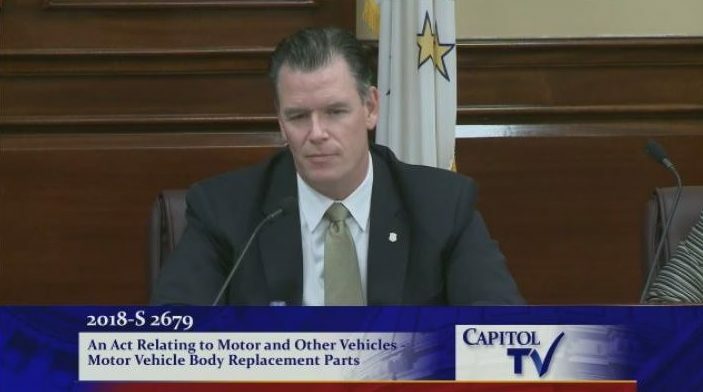 The Rhode Island Senate Judiciary Committee on Tuesday voted to continue studying a bill expanding the state’s parts choice law to third-party claims, extending the duration for that choice and requiring OEM repair procedures be used on such parts. Proponents were optimistic of Senate Bill 2679’s chances Wednesday. The bill’s sponsors include Senate President Dominick Ruggerio, D-North Providence, and Senate Majority Leader Michael McCaffrey, D-Warwick, which would seem to bode well for it. Senate Judiciary Committee lawmakers also seemed skeptical of opponents’ arguments during the hearing Tuesday. Frank O’Brien, vice president of state government relations for the Property Casualty Insurers Association of America, told the committee that Rhode Island was already an outlier with its 30-month period in which customers must provide written consent for aftermarket parts. 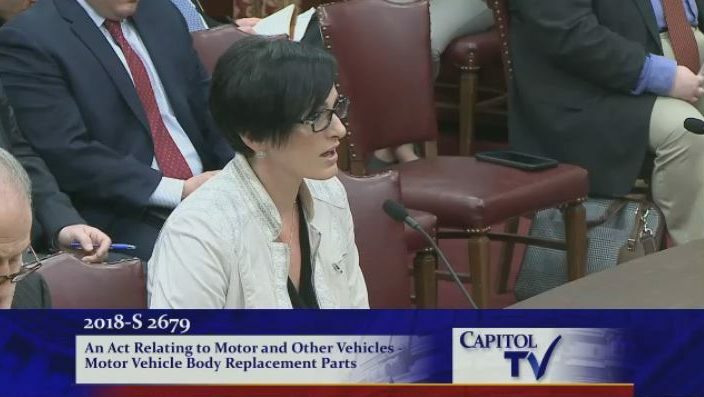 SB 2679 would extend this to 48 months “beyond the date of manufacture”; apply it to “any collision damaged part on the vehicle,” not just “body” parts; and formally grant it to third-party claimants — not just the “first-party” vehicles specified under current Rhode Island law. “I’m a little troubled by the argument,” he said. At times, benefits “far outweigh the cost,” Lombardi said. He also challenged the idea that SBS 2679 was a question of insurers versus body shops. Lombardi said he had an Audi A7 and questioned the notion of putting anything aftermarket on it. “I can’t imagine there’s a consumer out there” who would choose aftermarket, he said. Insurers stressed the notion of choice, though Lombardi said the bill gives consumers the ability to pick aftermarket or OEM parts. However, aftermarket parts and recycled parts advocates pointed to language that “No insurance company may require any repairer to use repair specifications or procedures that are not in compliance with the recommendations of the original equipment manufacturer for those parts,” arguing that it effectively prohibited the use of anything other than new OEM parts given manufacturer position statements. O’Brien suggested that consumers should have a choice, but people want the “the best” and “most expensive” when the insurance is paying. Particularly, we’d note, as the consumer has paid premiums for months should such an incident requiring replacement parts arise. “I would have to struggle with that hypothetical as well,” O’Brien told Lombardi. He said it came back to the “no free lunch argument” that more expensive repairs flowed through the system and drove premiums upward. But Committee Vice Chairman Sen. Stephen Archambault, D-Smithfield, said “I take offense” at the notion that a customer shouldn’t want the best. He also questioned what would happen to a third-party claimant struck by the insured. Archambault also attacked the notion that the bill would increase insurance premiums. He said nobody had testified that premiums would for certain rise; it was all indirect, trickle-down economics, he said. It’s a “profit issue,” said Petrarca (Petraraca & Petrarca Law Offices). O’Brien said that an insurer has a vested interest in making a customer happy with its parts choices — dodging the fact that a third-party claimant isn’t a customer. Lombardi said he was troubled by the “vested interest” notion. An insurer had a “duty” to protect the insured — not just the financial interest in doing so. 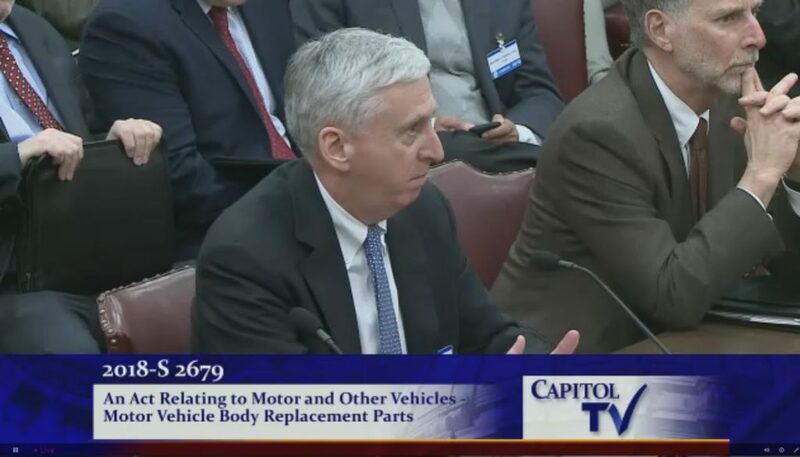 Randy Bottella, owner and operator of Reliable Collision, told the committee that while some carriers indeed offered their customers the choice of OEM or aftermarket parts after 30 months, they wouldn’t extend the same luxury to someone their customer hit with a car. “I (a third-party claimant) am not afforded that luxury,” he said. Bottella also pointed out two reasons why the 48-month time period would be useful. As the law is keyed to production date, a customer might already have “a number of their months chewed up” between the time the vehicle is built and the time it’s sold to them by a dealership. 40 months. He also said that some customers have 36-month and even longer leases — which can require the lessee to use new OEM parts or pay a penalty upon the vehicle’s return. That would make the existing law insufficient to protect them. Jeff Taylor (the Mayford Group), lobbyist for MetLife, said his company hadn’t heard such issues in other states. Lombardi asked him if an insurer could demand aftermarket parts on a lease even if the lessor demanded an OEM. “You see the dilemma there?” he said, and Taylor agreed. 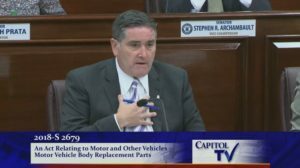 Sen. Donna Nesselbush, D-Pawtucket, asked Petrarca about the idea of policyholders receiving an option for a discount in exchange for accepting aftermarket parts. Unless the discount was directly made available to a consumer rather than hypothetically trickling down to them, “I can’t see it. I don’t buy it,” she said. Even then, she suggested that a customer might still regret the decision to go cheap. Personal injury lawyers see that all the time, she said, where a consumer buys the minimum coverage and regrets it. We’ve previously dissected the insurance industry claim — using its own numbers — that the loss of aftermarket parts would skyrocket premiums. In reality, premiums rise by around $20 a year nationwide. Insurers seem to have no problem raising premiums far more than the price increases in inflation, new car, auto part, and auto body repair costs. And there’s no guarantee premiums won’t increase anyway even if insurers get what they want with regard to parts. Finally, Rhode Island auto property damage insurers did quite well in 2016 (the last year with data available from the NAIC), paying out only 78.1 cents off every $1 in premiums in claims and overhead — and managing to spend another 14.2 cents in “Selling Expenses” like agents and advertising. After miscellaneous costs like taxes, fees and dividends are factored in, they wound up pocketing 4.2 cents of every premium dollar. Rhode Island auto liability costs before selling expenses, taxes and fees and dividends were higher but still only 92.6 cents on the dollar. After the other bills are examined, auto liability insurance ultimately cost carriers 10.4 percent more than they collected in premiums. About 14.4 cents on every premium dollar went to selling insurance, however. As third-party auto damage claims tend to be lower than first-party ones, we suspect the lack of profitability here is attributable to the bodily injury end of things — not third-party property claims. Finally, insurers also have a perfect safety valve should the boogeyman of OEMs hiking replacement price costs actually come to life: Total the car and sell it. The sale value plus all of the premiums they’ve collected plus the investment revenue from the “float” before the crash ought to make up for much, if not all, of the risk. They also have another market-based safety valve: Charge less to insure vehicles with lower parts costs and let the free market punish these theoretical price-gouging OEMs.